Language:English, TokPisin or Melanesian Pidgin, Motu, 700+ indigenous languages. Area:Land 452,860 km². Freshwater 9,980 km². Exclusive economic zone 3,120,000 km². Terrain: Mainland PNG is mostly mountainous with coastal lowlands and rolling foothills. Smaller island groups (Bismarck Archipelago, New Britain, New Ireland and the North Solomons) are mostly volcanic with mountainous interiors. Climate: Tropical with distinct wet and dry periods December to March and May to October respectively. Temperatures are cooler in the highlands. Geography: Shares island of New Guinea with Indonesia. Economy: Important industries are copra, palm oil processing, gold, silver, copper, crude oil production, plywood production, woodchip production and tourism. Main export commodities include oil, gold, copper ore, logs, palm oil, coffee, cocoa, crayfish and prawns. 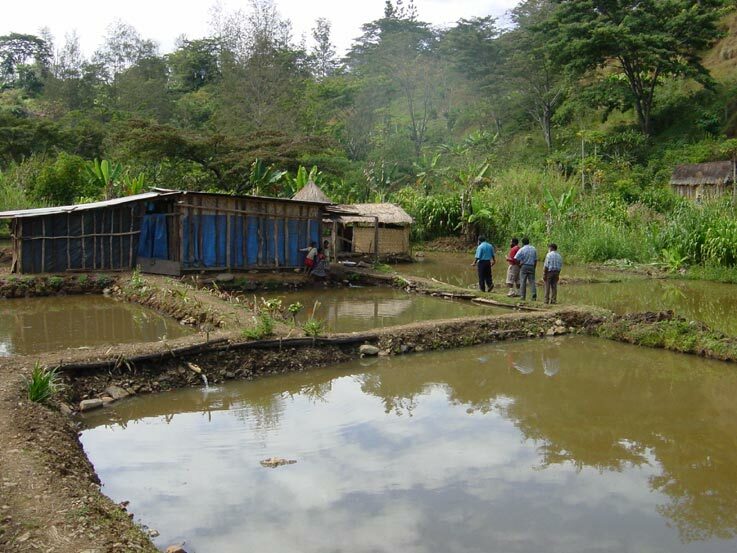 Fish pond culture was introduced to supplement protein deficient diet of the highland communities in PNG. 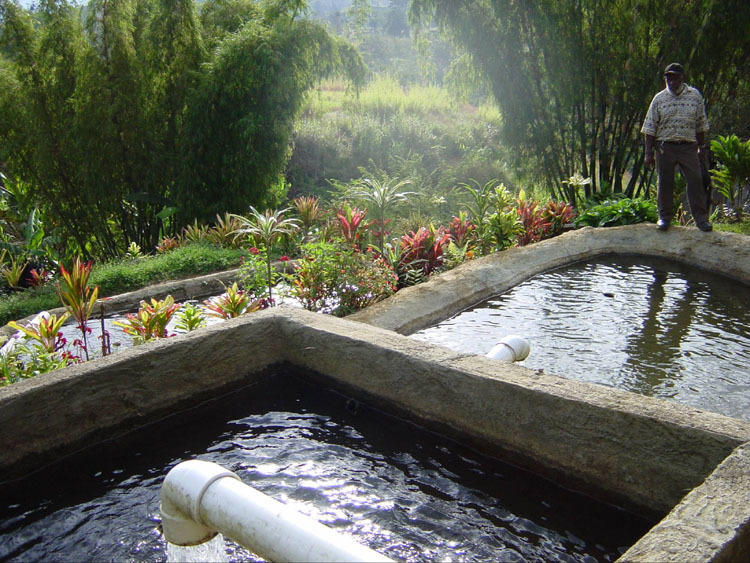 Several experimental fish culture stations were established such as the Aiyura Agricultural Experimental Station, Bomana Quarantine Station, Dobel Fisheries Experimental Station and Kanudi Station. Trout was initially introduced in 1949 and rainbow trout (Oncorhynchus mykiss) introduced in 1952 from Australia and New Zealand for release into streams and rivers where they became established. Rainbow trout was more adaptable to local conditions than other species in rivers above 1,200 m altitude but required restocking in some areas. A trout farm at Mendi, Southern Highlands Province was established for rearing and release of imported rainbow trout ova. The Kotuni trout farm was a small-scale commercial farm producing rainbow trout from imported ova utilising an intensive culture system. Constraints to the farm were high costs of imported feed, limited skilled labour and high capital investments restricting the farm from any profit generation. Tilapia was introduced in 1954 for experimental culture at Dobel, Goroka and Papua. Following its introduction it spread prolifically around the territory especially around the lowland areas where it became established as part of the local subsistence diet as well as an important commercial fish. Carp was identified as one of several species for introduction into PNG as its freshwater fauna was relatively poor. The first introductions of Singapore (golden) carp was in 1958, common carp in 1959, western carp-gudgeon 1961, silver carp in 1961 and grass carp in 1964. Several introductions followed afterwards. Carps were cultured at government stations and distributed throughout the country. Carps became established in most water systems. Oyster culture was attempted in the 1950s. The first attempt in Port Moresby was not successful, as conditions were not suitable. A second attempt in Milne Bay produced encouraging results after high mortalities at different test sites and trials of spat collection methods, which eventually led to the successful harvest of oysters in 1964. These were reported excellent and of good quality. The project ended due to change in staff and water transport. Constraints identified for oyster culture were seasonal red tides and potential for shellfish poisoning. Two groups in the mid-1960s attempted pearl culture. A Japanese-Australian joint venture in Fairfax Harbour claimed success and pearls were exported. However, operations closed down in 1975. Pearl cultivation in Fairfax was intensive and proved uneconomical. Pollution further compounded the problem. The Milne Bay pearl operation extended to include several communities (12) but financial constraints resulted in the decline of the industry in the 1980s. However, a few villages were still culturing pearls in 1982. Crocodile farming was initiated in response to declining wild populations due to harvests for the skin trade. Legislation to control harvesting of wild crocodiles resulted and small farms and experimental stations were set up. A approach to improve and expand the network of farms by integration with local community was developed. The local community participated in juvenile rearing and larger juveniles were transported to commercial farms when technical know-how and regular supply of feed was available. In 1981, 30,000 crocodiles were bred in captivity. The University of Papua New Guinea carried out giant clam culture and stocking of wild clams as a research activity. - Mariculture facility to produce fingerlings/spat/juveniles of overfished reef species for restocking purposes. The National Fisheries Authority (NFA) Inland and Aquaculture section has plans for improvement of the highlands freshwater culture, as well as mariculture development. Pond culture of carp and rainbow trout (Onchorynchus mykiss) is a back-yard activity for highland and some inland provinces. The number of farms is reported to have exceeded 6000. Fingerlings for pond stocking are supplied by several private hatcheries but the main supplier is the government hatchery, Highlands Aquaculture Development Centre (HAQDEC) at Aiyura. Commercial interests in tilapia farming are either emerging or established. Local barramundi farming was an initiative developed by the private sector together with Australian partners. Fingerlings are cultured to table size fish at Madang for the domestic market, and aiming at the Asian and Australian markets. PNG boasts the largest saltwater crocodile farm in the world. The farm targets the skin trade markets in Japan and France. A single commercial pearl farm in Milne Bay has been in operation since 1998 with more farms expected pending licences.